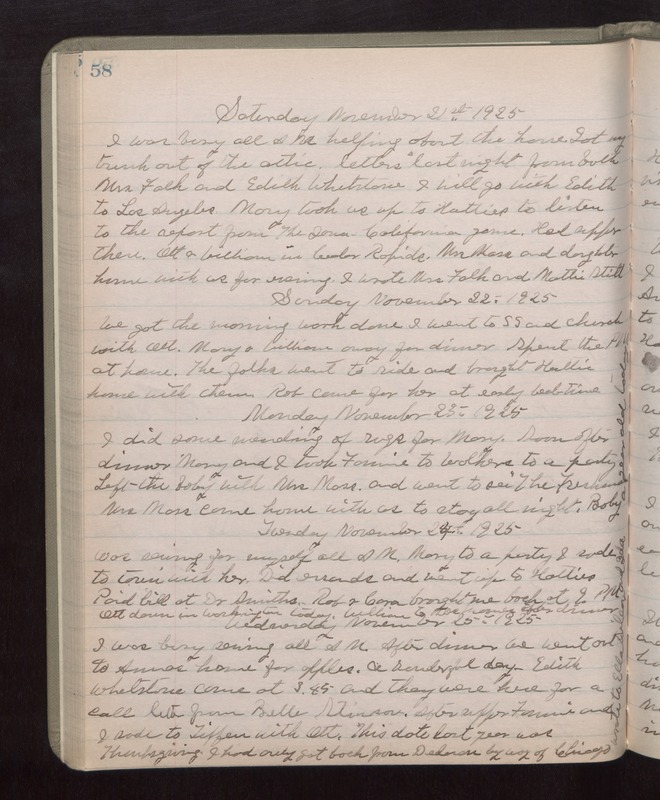 Saturday November 21st 1925 I was busy all AM helping about the house. Got my trunk out of the attic. Letters last night from both Mrs Falk and Edith Whetstone. I will go with Edith to Los Angeles. Mary took us up to Hatties to listen to the report from The Iowa - California game. Had supper there. Ott & William in Cedar Rapids. Mrs Mass and daughter home with us for evening. I wrote Mrs Falk and Mattie Stitt. Sunday November 22nd 1925 We got the morning work done. I went to S S and church with Ott. Mary & William away for dinner. Spent the PM at home. The folks went to ride and brought Hattie home with them. Rob came for her at early bed-time. Monday November 23rd 1925 I did some mending of rugs for Mary. Soon after dinner Mary and I took Fannie to Walkers to a party. left the baby with Mrs Mass and went to see "The Freshman." Mrs Mass came home with us to stay all night. Baby a year old today. Tuesday November 24th 1925 Was sewing for myself all AM. Mary to a party. I rode to town with her. Did errands and went up to Hatties. Paid bill at Dr Smiths. Rob & Cora brought me back at 9 PM. Ott down in Washington today. William to Des Moines after dinner. Wednesday November 25th 1925 I was busy sewing all AM. After dinner we went out to Annas home for apples. A wonderful day. Edith Whetstone came at 3.45 and they were here for a call. Letter from Bell Stinson. After supper Fannie and I rode to Tiffen with Ott. This date last year was Thanksgiving. I had only got back from Delavan by way of Chicago. Wrote to Ella Wilcox and Ida.